According to The Pulse Of Radio, the bats may finally be having their revenge on Ozzy Osbourne for defiling a corpse of one of their own species all those years ago. The Prince Of Darkness must shell out $27,000 to have a colony of bats removed from his estate in Buckinghamshire, England. The bats were discovered while Ozzy was having the house renovated last May, with work halted until Ozzy could comply with the Wildlife And Countryside Act of 1981 and the Conservation of Habitats Species Regulations of 2010. A local council has greenlit the bat removal, but a license must be obtained to have them relocated to a different home. The intricate process involved in the relocation will cost roughly $27,400. If Ozzy decided to remove the bats illegally, he could face a fine of around $7,600 per bat or a six-month jail term. The singer mistakenly thought a fan had thrown a rubber bat onstage, but when he picked it up and chomped down on it, he realized it was real. He had to go for a painful series of rabies shots as a result. While not dealing with his winged nemeses, Ozzy is preparing to headline an event called Ozzfiesta in Riviera Maya, Mexico this May. In addition to a headlining performance from Ozzy, the five-day festival will include a dinner party hosted by Sharon Osbourne, performances by other artists, a question-and-answer session with Ozzy and his band, a Comedy Club Night, a charity golf tournament and more. 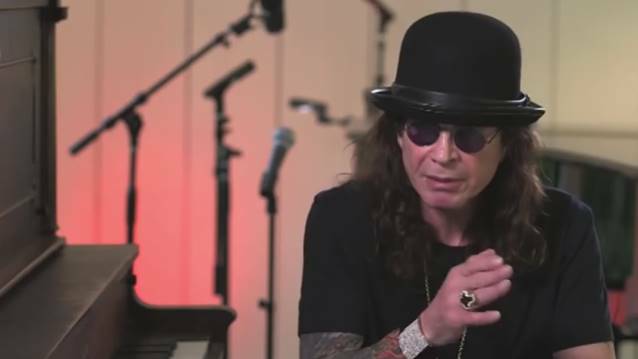 Also on Ozzy's agenda for later in the year are a month-long residency in Las Vegas called Hell Gate and a return to the studio with BLACK SABBATH.